Ok, I'll admit it! I've been a Trekkie for most of my life. Little did I know, as I sat glued to the tube for at least an hour each week (and then five times a week) that I was being introduced to a basic concept of metaphysics. Most of us take it for granted that thought and emotions are just natural qualities of the human mind or "psyche" (the word "psyche" is from the Greek word for "soul"...therefore psychology was originally the study of the human soul, and only later became a study of the unbalanced mind). Intuition, on the other hand, is placed in a category all its own, somewhere outside the normal range of human experience. 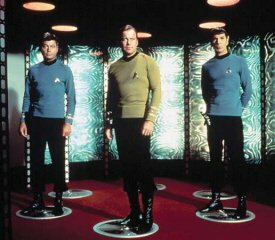 If you were ever a Star Trek fan (and if you're not, I'll explain the picture you see above) then you remember that Spock was the "logical" one (thought), Dr. McCoy was the "emotional" one (emotions), and Kirk was...well, Kirk was the Captain. He was the one who took in the information, observed the situation, considered the consequences of his options (including the emotional consequences) and then made choices that he then used to direct the Enterprise and the crew. To me, the ship "Enterprise", represents the human being. The crew is like the cells and organs. It was the sharply developed qualities of the "mind" of the ship - it's Captain, First Officer, and the Doctor - that made the ship extraordinary, and kept so many of us highly entertained for many years. Unfortunately, in most modern Western cultures like Europe and the U.S., the quality of thought has been given the lion's share of the attention. With the growing awareness of "emotional intelligence" that gross inequity has been somewhat remedied. But it is only very recently that intuition - the "inner captain", that quality that allows us to tap into the subconscious mind, receive guidance and inspiration, and make high calibre decisions and choices - has been generally recognized, accepted, and given the attention it so deeply deserves. Developing intuition takes time and practice, just like learning to think, or discovering the true purpose of your emotions. Add highly developed intuitive abilities to well managed thoughts and emotions and discover a level of mind and a quality of life experience that was previously beyond your imagination. 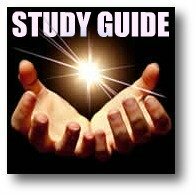 Develop your intuition now by visiting the links below, OR, Go Back To: Spiritual Metaphysics to learn more about how everything is connected. The purpose of the Intuition Network is to help create a world in which all people feel encouraged to cultivate and use their inner, intuitive resources. The Intuition Network offers opportunities for networking among individuals who are interested in cultivating and applying intuition. This networking takes place via phone and fax, newsletters, journals and magazines, radio and television, small group gatherings, conferences in "cyberspace," conferences in hotels, and international travel and spiritual retreats. The Intuition Zone: Unleash Your Inner Compass & Awaken The Extraordinary Power Of Your Intuitive Genius! "Guru" Warning: NO ONE, no expert, teacher, healer, doctor, not me, your parents, friends, or closest loved ones, have all the answers for you. BUT, the answers are there, and somebody does know.... unequivocally. That someone is... YOU! YOU Are The One You Have Been Waiting For! Go Back To: Spiritual Metaphysics to learn more about how everything is connected.